Enjoy a swim in the lake! Boasting a breath taking lakeside setting, this air-conditioned apartment promises budget-friendly holiday bliss in Bissone, and is just a 16 minutes’ drive away from the cosmopolitan highlights of Lugano. The flexible 3rd floor retreat easily sleeps 2-4, and provides a carefree ambience in which to enjoy quality holiday moments together; as a couple or family. With the bright open plan apartment complemented by a host of onsite facilities too (including swimming pool, boat mooring, parking and lake access), the scene is set for a memorable Lake Lugano escape! With its spacious and welcoming layout, the open plan living room lets families sit back and enjoy timeless moments together. With direct access leading out to a covered private balcony and a modern kitchen diner for 3-4 to hand too, the scene is set for easy-going year-round stays. 2 sun loungers also feature with the apartment. The modern residence offers laundry facilities and also lift access (making it wheelchair and child-friendly). In total 25 apartments have use of the outdoor swimming pool. The lakeside residence benefits from a shared landscaped garden with resident swimming pool, a sunbathing area and a boat mooring pontoon with lake access and shower. A table tennis and fuss ball area also offers the perfect timeless holiday distraction. A private parking space features with the apartment. Those hiring a boat will be able to moor up too. The modern family-friendly residence enjoys a beautiful lakeside location in Bissone. 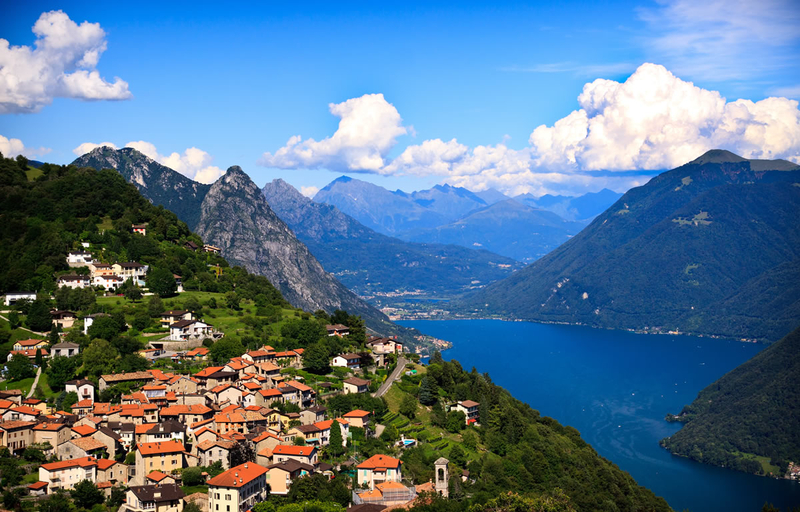 The well-serviced lakeside town offers a lovely array of authentic eateries and restaurants to sample, and is also just 16-20 minutes away from the city highlights, golf club and airport of Lugano. Lugano city offers a wealth of city delights to experience; from fine dining and designer shopping to buzzing clubs and casinos, museum trips, lakeside park picnics, boat tours and soaking up the year-round cultural events. The fashionable Swiss lake capital also offers close proximity to a plethora of hiking routes and outdoor activities. Bissone also offers close proximity to the family-friendly Mount Tamaro Adventure Park. From the pretty lakeside idyll, guests are just 19 minutes’ drive away from Lake Como too (with the ancient well-connected lakeside town of Argegno just a 37 minute drive away).